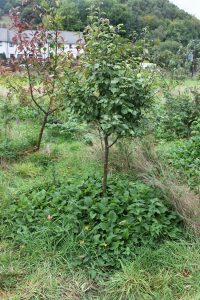 We are down at Cau Bodfach every Tuesday for a couple of hours from 11am – 2pm where we are maintaining the community orchard and making plans for future developments. We are hoping to work with the local school on a new willow project at Cae Bofach which demonstrates an interesting way that farmers can use land to help mitigate climate change, improve biodiversity whilst generating an annual income. There are always interesting observations to make every time we visit the orchard. it is amazing to watch a whole new ecosystem evolve in front of your eyes. 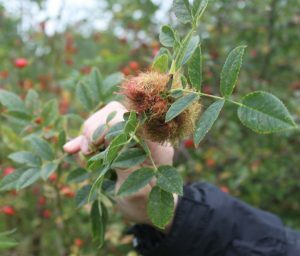 round fluffy ball in which the baby wasps are incubated, it is also known as a ‘Robin’s Pincushion’. You are welcome to join Han and Alex of the Cae Bodfach team here on a Tuesday from 11.00 am in the coming weeks.